Some times we come across a lovely new app for tulip lovers. The new Tulip festival in Dronten has developed several routes along the flower fields and made a wonderful app based on GPS position where you can hear interesting information along the route. Tulip Carré – The royal theatre Carré, situated in the city center of Amsterdam has his own tulip Carré -since last March! The director of the theatre, Madeleine van der Zwaan and the American cast of the Broadway musical hit PIPPIN baptized their tulip two weeks ago in Amsterdam. 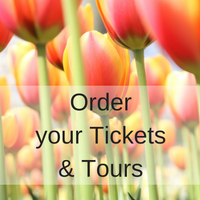 Following a successful event in 2015, the preparations for the Tulip Route Dronten 2016 are well on their way to make sure the tulip route for this year is of a significantly higher quality. The number of tulip fields included in the route has been increased to over 85 fields this year. And the number of activities en-route has also been increased.